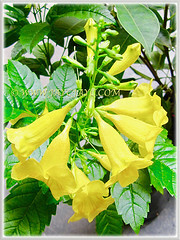 Tecoma stans or Yellow Bells has captivating and vibrant yellow flowers. It is the official flower of the United States Virgin Islands where its cheerful yellow blossoms have long been appreciated for their contribution to tropical colour. 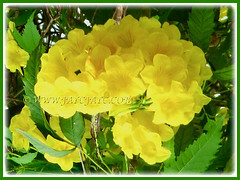 It is also the floral emblem of the Bahamas. Common Names: Yellow Bells, Yellow Trumpetbush, Yellow Elder, Ginger-thomas. Etymology: The generic name is derived from the Nahuati word tecomaxochitl which was applied by the indigenous peoples of Mexico to plants with tubular flowers. Origin: Native to United States, Mexico to northern Venezula and Argentina. They are naturalized in Africa, Queensland in Australia, in the Pacific, southern and southeastern Asia. 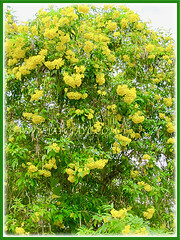 Plant type: An ornamental tropical tree or densely branched shrub. 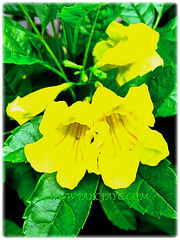 Features: Tecoma stans is a species of the genus Tecoma that comprises of 14 species of flowering plants. An irregularly shaped flowering perennial shrub that grows to about 0.9-18 m in height. It has several stems and slender erect branches. 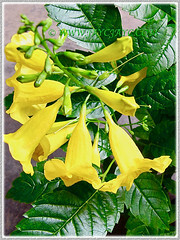 It bears large, showy, bright golden yellow trumpet-shaped, measuring 2.5-5.1 cm.There are two folds along the bottom of the flower’s throat and several delicate rust-red lines decorating the interior. The blooms appear in flushes throughout the growing season. It is drought-tolerant and grows well in warm climates. Tecoma stans gets its common name, Yellow Elder from its superficial resemblance of its foliage to that of elderberry. It produces bright green opposite leaves that are pinnately compound with 1-9 sharply pointed oval to lance-shaped green leaves. The 5-7.6 cm long leaflets have sharply toothed edges. They are borne on very short petioles and are slightly hairy on the undersides along the midrib and in the vein axils. The dense, lushly green foliage is evergreen in tropical climates. The bark of the main trunk is light brown and becomes corky with age. They hang in showy clusters at the branch tips and forks, bending the twigs into arches with their weight. They are followed by 10.2-20.3 cm long stringbean-like pods with papery wings and hang in vertical clusters. 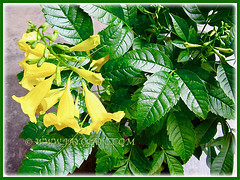 Culture (Care): Tecoma stans or Yellow Bells can be easily grown with minimum care. Light: Best with full sun. Moisture: Low to moderate water requirements. Can be drought tolerant. Soil: Best in well-drained rocky, sandy and loamy soils. However, it can tolerate any commercial garden soil with good drainage. Others: Prune down the branches to encourage bushiness. You may want to prune as needed after flowering. Deadhead flowers to prolong bloom. It can be invasive. Generally free from serious insect or disease problems. However, do watch out for spider mites and whiteflies on indoor plants. For subtropical and temperate regions: Hardiness: USDA Zone 7 – 11. Tecoma stans has freeze tolerance that varies dramatically, with some forms able to survive temperatures down to around -12.2º C and others severely injured by only a few degrees of frost. A perennial to Zone 7. 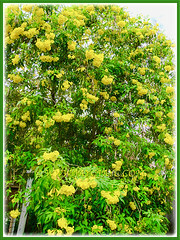 It has bright yellow flowers and dense, lushly green foliage that is evergreen in tropical climates, but deciduous in chillier places. Although reliably hardy down to -2.2ºC, the roots may survive temperatures into the low twenties. Advisable to grow in containers that can be overwintered indoors as houseplants. Propagation: Fresh seeds germinate readily in sandy soil in the spring. Cuttings root easily under mist in the summer. Choose vigorous young semi-woody branch tips and not old woody stems or fresh green shoots. Bottom heat will encourage rooting in cooler weather. Usage: Tecoma stans or Yellow elder is excellent to be grown as a captivating ornamental specimen in both commercial and residential landscapes. Suitable too to be planted as informal hedges or screens for some privacy. Ideal to be trained as a standard. It can be ground grown or in large tubs/containers. 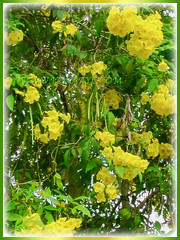 Yellow elder has been used for a variety of purposes in herbal medicine. Its primary applications have been in treating diabetes and digestive problems. Extracts from Tecoma stans leaves have been found to inhibit the growth of the yeast infection, Candida albicans. 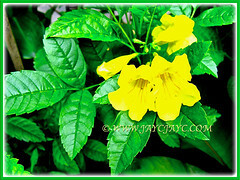 Plant Tecoma stans if you’re a nature lover as the flowers attract bees, butterflies and hummingbirds. Alpinia purpurata with red bracts is simply stunning!